Detailed Amritsari Chole | Authentic Punjabi Chole Masala Recipe | Restaurant Style Chole Masala recipe with step by step video tutorial. Amritsari Chole is Punjabi style chickpea curry. This amazingly authentic curry tastes heavenly. This dish is sure to bring a flavor of Amritsar streets right into your home. It is so inviting and rich, spicy and full of awesome flavors. That’s because I went the traditional route this weekend. By traditional I mean I made some traditionally authentic food ‘Amritsari Chole’. You have to throw in a little ginger and red onion. I mean, it is Monday, and red onions make a Monday more palatable. Hehehe jokes apart! This is a perfect weekend dish, which I am sharing on a Monday! So let’s talk all about this authentic and hearty COMFORT food — Amritsari Chole | Authentic Punjabi Chole Masala Recipe | Restaurant Style Chole Masala. YES! 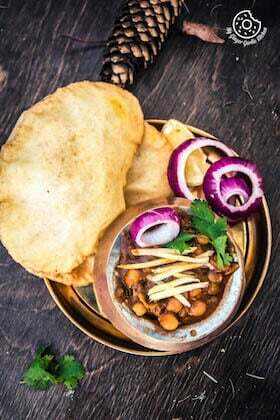 Simple Amritsari Chole in time for the Summer. This is what I call summer homey food. Well, there are no rules which say that we can’t enjoy some cozy food in summer. 😉 Right? And anyways, sometimes summer needs a little coziness too. And this is one of those cozy meals. It has everything you love about curry, and it’s ready to go in forty minutes. So much flavor in one bowl. Oh and the aroma of this curry! It is so so GOOD. And this aroma alone makes this dish worth making. ‘*Amritsari Chole | Authentic Punjabi Chole Masala Recipe | Restaurant Style Chole Masala’* is one of my favorite Punjabi dishes. Amritsar is a beautiful city in the Indian state of Punjab, which is famous for its authentic Punjabi food and the glorious Golden temple. So, some also call it a ‘Golden City’. Let me tell you about my today’s authentic dish ‘Amritsari Chole’. Here, you might ask, how can I make such an authentic dish of Punjab, even if I don’t belong there? Well, I am not from Punjab. That’s 100% true. But I am sharing a 100% authentic Punjabi dish that is also true. Here’s the interesting story. It was many years ago. One of our Punjabi neighbours ran a very famous Punjabi restaurant in the old town of Jaipur (in the Indian state of Rajasthan). 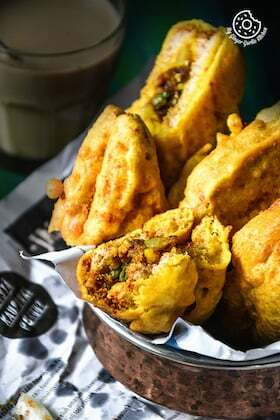 We always admired their ‘Chola Kulcha’, and ‘Chola Bhatura’. And why not? It was so damn delicious and authentic! With ‘Kulcha’ they always served this ‘Amristari Chola’ (Chickpea Curry). And I was just so mad about that particular dish’s taste. I used to always ask him to tell me the recipe to my Mom. But being a restaurant owner he said, “Why do you worry about the recipe so much. Do you love this Chola? Whenever you want to eat this dish, come to my restaurant or at my home, I will personally make this for you my girl”. I was pretty young back then, so I couldn’t understand why didn’t he just tell me the recipe then? Maybe it was too early for me to understand all about his complicated thinking. But now when I think as a grown up, I think he did the right thing. I would have done the same if I were in his situation. This restaurant was the only resource for his bread and butter. And his restaurant was only famous because of its very authentic Punjabi recipes. How could he tell the recipe to anyone! Maybe he was just afraid that if his recipe goes out then someone might copy that. So he was worried for his survival, which I totally agree now. And that was the reason he never told the recipe to anyone. Sure we did not run a restaurant, so there was never any danger of copying it for financial gains. And we got the recipe sometime later anyhow. How did we get the recipe? Restaurant owner’s daughter was my sister’s friend. So my sister asked her for the recipe a couple of times, and then she just gave away this recipe of ‘Amritsari Chola’ they used to make at home, which was almost the same as the Restaurant. However, we found out about that secret ingredient after a couple of years in an interesting way. After a couple of years, my Mom invited one of her friends for dinner. My Mom made this ‘Amritsari Chole’ for dinner. Her friend just loved the recipe, and asked my Mom if she has added some ‘Anardana’ to that? “Anardana? No.” said, my Mom. “I thought you have added that as all the Punjabi’s add this to their chola,” Aunty said. My Mom replied, “Ahh, I didn’t know about this ingredient. But will surely try it next time when I make ‘Amritsari Chole’ ”. And indeed, my Mom added anardana the next time she cooked this dish. This was it. Yes, this was the ‘SECRET’ ingredient which we were looking for all this time, which was missing from the recipe. We hit the jackpot! What I love about this classic protein rich dish is its texture and combination of spices that go into its making. And that additional Anardana adds a tangy punch to the chickpeas. Certainly, this is one of my favorite flavors in this dish. This dish is sure to bring a flavor of Amritsar streets right into your home. It is so inviting and rich, spicy and full of awesome flavors. Now whenever I crave for that Restaurant Style Amritsari Chole, I go for this particular recipe. This is a divine curry, and anyone who has tasted this cannot forget its heavenly taste. Although this curry is a little time consuming but really easy to make, and it’s worth every minute spent on cooking. 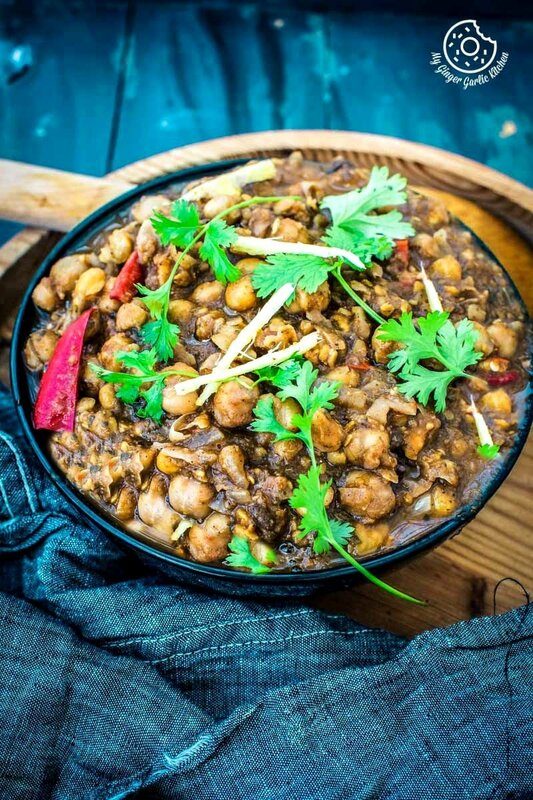 This Amritsari Chole recipe tastes just amazingly authentic. The ingredients are also basic and available at all Indian grocery stores. 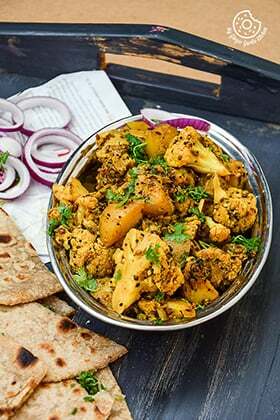 This curry has a bit tangy taste due to added amchoor powder and tamarind. And the king ingredient of this curry is chickpea. This Punjabi curry is also widely famous because of its distinct dark colored gravy. 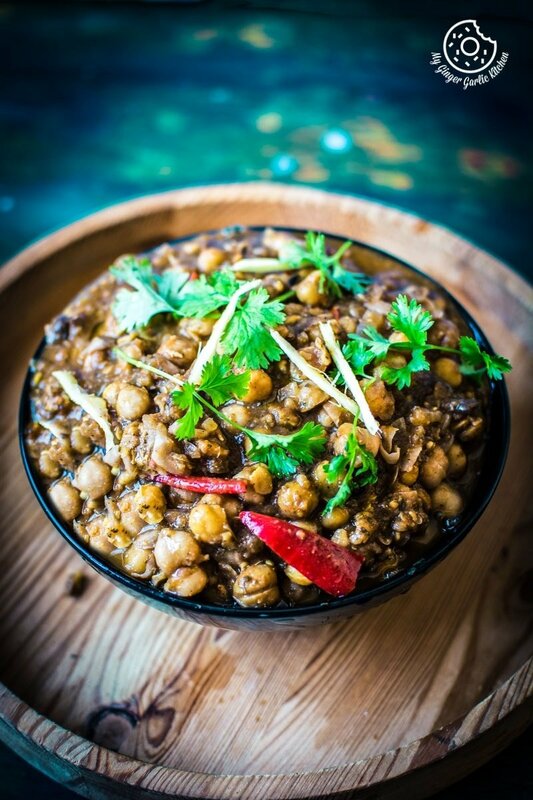 Amritsari Chole is an amazing party dish and most of your guests will just love it. You can serve this with almost anything as a side. This dish would certainly add an awesome flavor to everything. The list of ingredients might seem a bit long, but every single ingredient has its significance to make this dish authentic. So I try to not to avoid anything! If you pre-plan this recipe, collecting ingredients won’t be that hard. So let’s get started with Amritsari Chole | Authentic Punjabi Chole Masala Recipe | Restaurant Style Chole Masala. 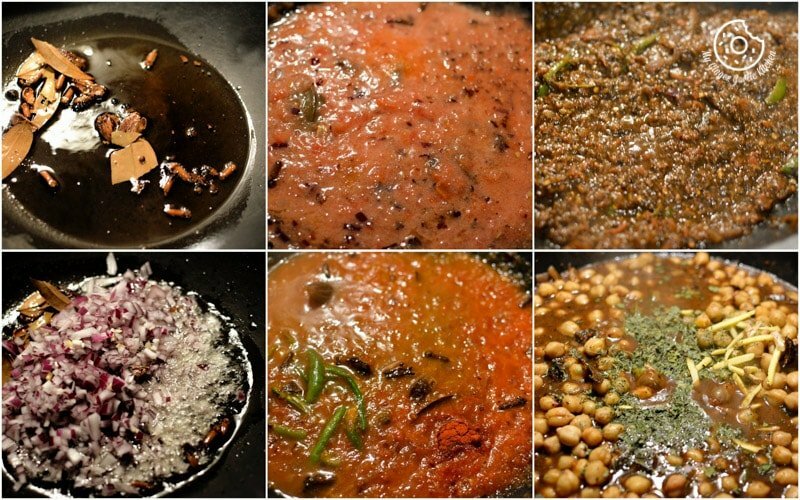 Let’s now learn to make Authentic ‘Amritsari Chole’. Heat oil in a pan. Add bay leaves, black cardamom, and cloves to the oil. Saute them for few seconds. Now add red onions, and saute for 5 minutes or till they turn golden brown. Add tomato puree, salt, slitted green chilies and red chili powder. Mix well and cook covered for 5 minutes. Add chana masala powder, dried mango powder, anardana, sugar, tamarind paste and mix well. Remove tea bags and add water to the sauce. Mix well, and cook for 5 minutes. Add cooked chickpeas, kasuri methi, sliced ginger and mix well. Add some water if needed. Cook covered for 20 minutes on medium-low heat. Add sliced onions, and mix well. Remove from heat and cover for 5 minutes. Amritsari Chole is ready. Amritsari Chole | Authentic Punjabi Chole Masala Recipe | Restaurant Style Chole Masala recipe with step by step video tutorial. Amritsari Chole is Punjabi style chickpea curry. This amazingly authentic curry tastes heavenly. 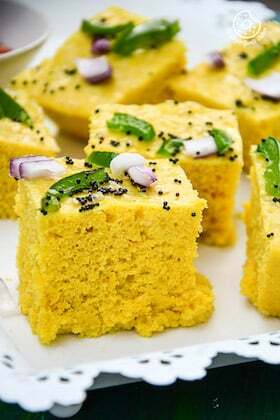 This dish is sure to bring a flavor of Amritsar streets right into your home. It is so inviting and rich, spicy and full of awesome flavors. 1. Heat oil in a pan. Add bay leaves, black cardamom, and cloves to the oil. 2. Sauté them for few seconds. Now add red onions, and sauté for 5 minutes or till they turn golden brown. 3. Add tomato puree, salt, slitted green chilies and red chili powder. 4. Mix well and cook covered for 5 minutes. 5. Add chana masala powder, dried mango powder, anardana, sugar, tamarind paste and mix well. 6. Remove tea bags and add water to the sauce. Mix well, and cook for 5 minutes. 7. Add cooked chickpeas, kasuri methi, sliced ginger and mix well. 8. Add some water if needed. 9. Cook covered for 20 minutes on medium-low heat. 10. Add sliced onions, and mix well. Remove from heat and cover for 5 minutes. 11. Amritsari chole are ready. Serve with any of your flatbread and enjoy.